The nice folks over at Prescott Frost Beef sent us some samples of their organic ground beef and all-beef hot dogs. Prescott Frost meat is 100% USDA Certified Organic with no hormones or antibiotics. Their beef is raised in Nebraska and fed only organic grasses and legumes. Prescott is the great-grandson of the late poet, Robert Frost. I thought that was so cool! I love Robert Frost poetry. We decided to test out the samples while watching football yesterday. We made our favorite hamburgers with the ground beef - they were fantastic! The burgers were extremely juicy and had great flavor. We both loved them!! 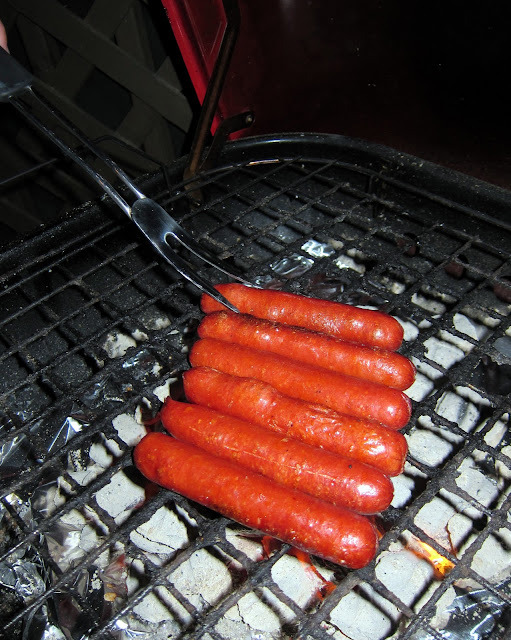 We also grilled up the hotdogs. They were good, but the casings were a little thicker than we liked and were a bit tough after grilling. The meat inside the casings was really good. I think that next time we will boil the hotdogs and see if that helps the casing not be as tough. Many thanks to Prescott Frost for the yummy meal yesterday! I love your blog. I'm writing from Italy. I'm your google followers now! If you want, come to visit me, you are welcome. Regan - they are online. They ship it right to your door! you just gave me craving for cheeseburgers... and cooked over charcoal... yum! Those burgers look yummy. Got a craving now! There is nothing like Nebraska beef :) I'm from the area where you got the meat and I get my side of cow from up there every year. So much better than some of the prepackaged store meat. It's beautiful country up there. They look fantastic! Nice folks indeed. Sounds like they are using thicker natural casings for their dogs and a lot of folks like that "snap" when biting through the dog. Not me, but some do. It's a matter of preference. The burgers look delicious too! I'd love to eat those burger Patties. They look so delicious with cheese on it. The hotdog sandwich looks delicious. This can also be served during children's parties like birthdays. Kids will surely love this food. I want the burger. Omg, it looks so yummy! Awesome post!